Many call the BCS National Championship Game the absolute highlight of the college football bowl (post)season and THE game of the BCS bowl games series. 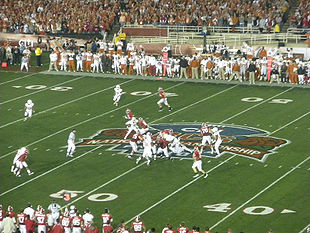 The intention of the last game of the Bowl Championship Series (BCS) is to determine the National champion of the NCAA Division I Football Bowl Subdivision. The very first time the BCS Championship game was played was in 1998 at the conclusion of the 'regular' college football season. In case you wonder, what are the names of the BCS bowls: Back in the late 90's the game was initially rotated among the four participating (BCS Rose Bowl, Orange Bowl, Fiesta Bowl, and the Sugar Bowl) bowl games. As time went by, beginning with the 2006 season, the BCS National Championship Game became a separate event played in the week following New Year's Day, which for the 2011/2012 season will be on January 9, 2012 in the Mercedes-Benz Superdome in New Orleans, LA. Alabama Crimson Tide and the LSU Tigers are matched-up to win the trophy this time. 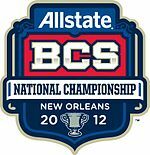 The 2012 BCS Championship Game game day and time are January 9, 2012 at 8.30pm EST (7.30pm local time in New Orleans), matching up LSU vs Alabama. ESPN and ESPN HD televise the game nationally, with a simulcast on Xbox LIVE , ESPN3.com and ESPN 3D (Save on ESPN The Magazine at BlueDolphin.com ). The 2012 (for the 2011 Bowl Game Season) sponsor is Allstate. At Allstate.com, safe drivers pay a whole lot less. Stay accident-free, and you could save 45% or more on your car insurance. Quote Now! Depending on who the title sponsor of that year's bowl host location is (Allstate's the sponsor for the 2012 Sugar Bowl), will also be the title sponsor for the championship game. Buy your BCS Championship Tickets now and be one of the enthusiastic fans at the Rose Bowl in Pasadena, CA.